UAF has the best view in town. 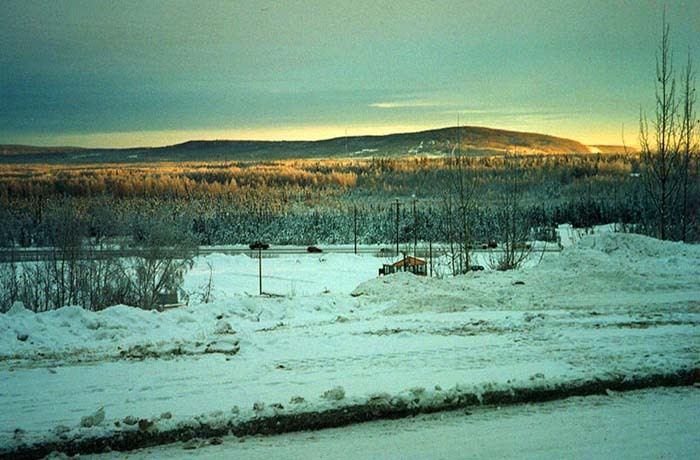 The campus is situated on a ridge on the northwest side of Fairbanks overlooking the Alaska Range. The University of Alaska Fairbanks is the northernmost American university and international research center. In 1917, when Alaska was not yet a state but still a territory, it opened as 'Alaska Agricultural College' with six students. Today it is part of a statewide university system, together with UAS in Juneau and UAA in Anchorage. More than 8.000 students attend the 2.500-acre Fairbanks campus. 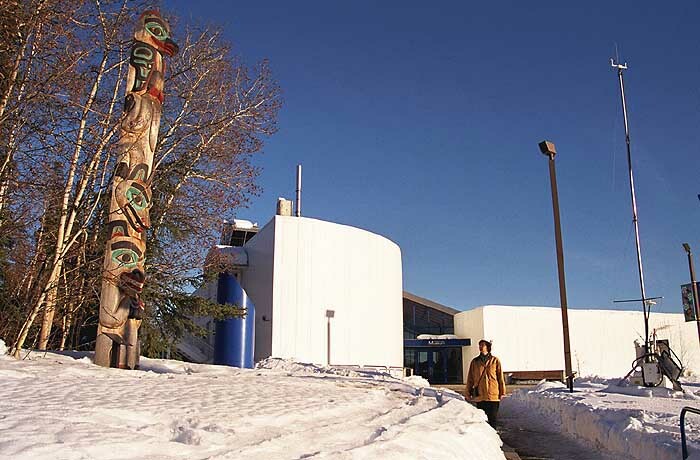 UAF is highly regarded for its arctic research and Alaska native studies. The university is the largest civilian employer in the Tanana Valley with more than 3,350 full- and part-time faculty and staff, student workers included. The UAF 'Gruening Building' was constructed in 1971 and opened in 1973 as a general-use classroom and office building. It was the first structure over three stories high on the UAF campus. The building is named after Ernest Gruening (1886-1974) who was governor of the territory of Alaska from 1939-1953 and served as the first Alaskan senator till 1968. Each year when spring arrives students use the roof of the Gruening Building for their traditional 'watermelon drop' (look out below!) to celebrate meltdown. 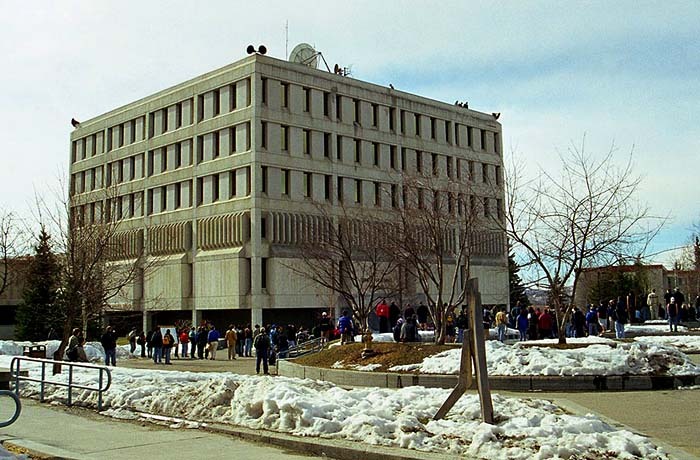 UAF named its Eielson Memorial Building from 1934 after a famous bush pilot, Carl Ben Eielson (1897-1929), who pioneered air travel in Alaska. The aviator also had a mountain peak near Mount McKinley named after him. And in 1948 the U.S. Air Force renamed its airfield and base southeast of Fairbanks 'Eielson Air Force Base'. 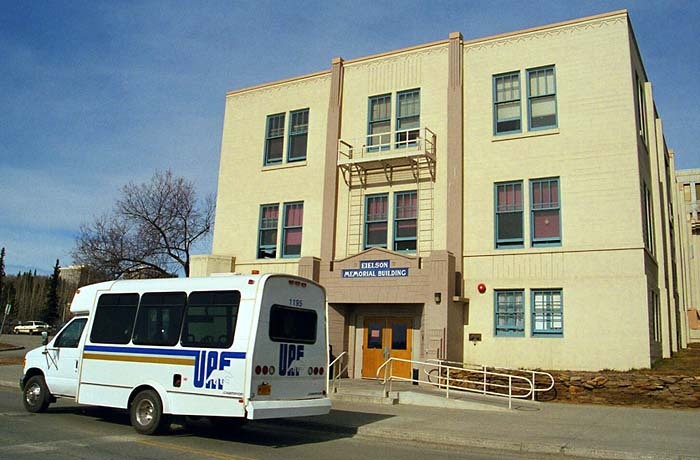 UAF runs free shuttle busses around campus. They stop at all parking lots and the University Museum. The University Museum on campus is one of the best attractions in Fairbanks. It features an interesting gold collection, excellent displays and exhibits like 'Forced to Leave', about the detention of Alaskan Japanese Americans and Aleuts during World War II. Other highlights include Babe the Blue Bison (a 36.000-year-old bison mummy), a three-ton copper nugget, totem poles, ivory carvings, a giant Kodiak grizzly bear, and polar dinosaur bones. The Museum Store not only sells the usual books and cards, but also native Alaskan music, native artwork and jewelry. A winter view from the UAF campus.